Liberty University Press proudly announces the release of “Experiencing Jesus’ Joy” by Liberty professor James B. Joseph. “Brother James” invites both new and seasoned believers to join him in developing a deeper, more satisfactory relationship with Jesus. “Experiencing Jesus’ Joy” gives the reader practical steps to finding their God-given purpose in life and how to experience more Godly joy. Dr. Joseph, Brother James, earned graduate degrees from Wake Forest University, Hood Theological Seminary, and Southeastern Baptist Theological Seminary. He is an ordained pastor and an adjunct professor at Liberty University teaching seminary classes. His earlier book, Victory in Jesus: Being a Child of God (1997), brought good reviews from many Christian leaders of various denominations. 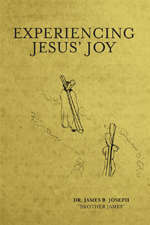 Experiencing Jesus’ Joy is available to purchase on www.Amazon.com and www.BarnesandNobles.com.